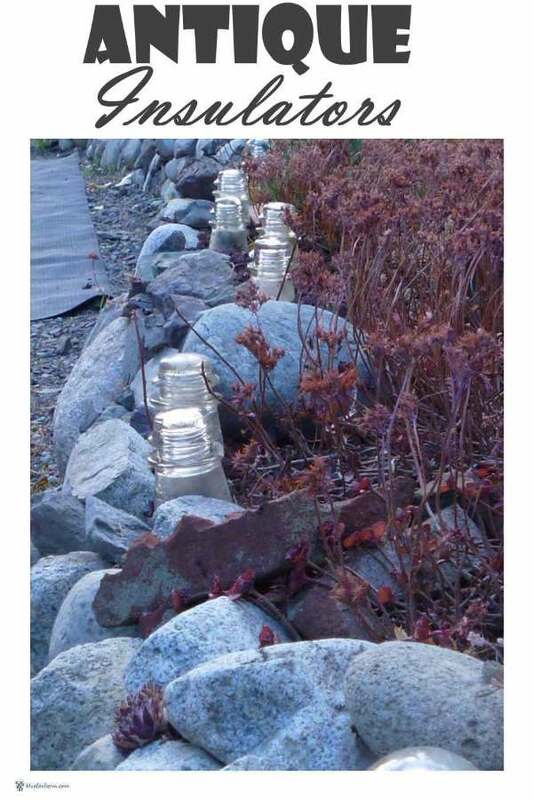 Antique glass insulators are a collectible that you see pretty much everywhere, but unless you know what you’re looking at, you don’t know the value of it. Glass and porcelain insulators have been around since the early days of electricity, and are the safest way to keep electricity in its place – in wires, not in the surrounding buildings where it can pose an electrocution hazard to anyone unlucky enough to touch it. The glass insulator was screwed onto a wooden hook, which was attached to buildings or the power pole, and then the live electric wire was wrapped around it. The important aspect of using glass insulators is that the wire doesn’t touch anything else. Glass and porcelain don’t conduct electricity, making them a safe choice for this new technology. Eventually, other systems were designed for making the wires safe, making the intriguing and interesting antique glass insulators obsolete. As a collector of old junque, I’ve salvaged lots of antique glass bottles and antique canning jars; along with them, as just an extra I’ve accumulated quite a few of these insulators. I never actually appreciated their worth, I’m ashamed to say. Now that I have quite a collection, I’ve found uses for them. They make great sun catchers in a sunny window, along with other antique coloured glass. They come in a lovely aqua blue, clear and sometimes other colours and the glass is so thick that they’re hard to break, making them perfect for door stops. When they’re dumped into the ocean which is the default disposal method for a lot of things, they’ll sometimes be washed up as sea glass, and after pounding them into the sand and rounding their edges, the ocean spits them up as gorgeous jewels. See more on this site: Odysea Sea Glass (opens in a new window). 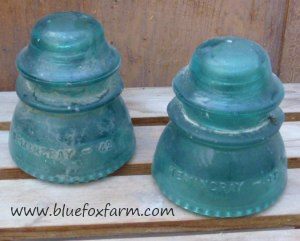 Some of the manufacturers of other glass items also made the antique glass insulators – Dominion was a maker of glass containers such as canning jars, bottles and many other household items. Hemingray made many different sizes of the insulators, from those used on power lines to ones for households. 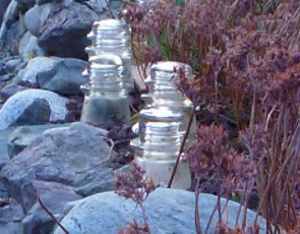 If you’re starting a collection of antique glass insulators, look in garage sales and junk shops – and pay particular attention to dusty corners and boxes of mixed accumulations – you never know when you’ll unearth some buried treasure – antique glass insulators.